The Bridge is a mixed reality project which will happen in two phases. 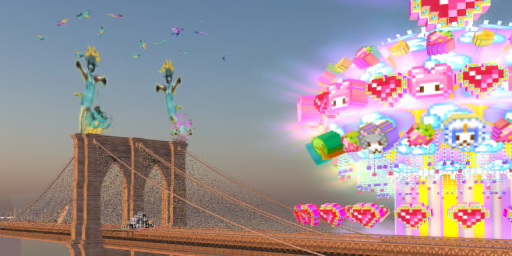 The first phase of the project includes the installation of virtual art on the virtual Brooklyn Bridge. 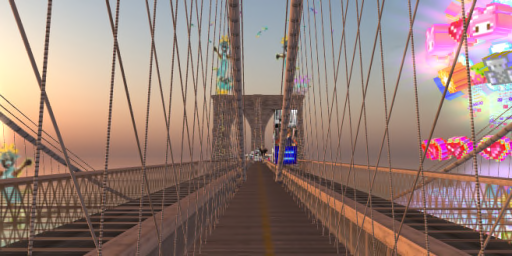 The second phase of the project includes mixing the images of the virtual view with the real images and views of the Brooklyn Bridge. In Phase II people can apply to have access to an exclusive beta account of the app Membit. Using the augmented reality app Membit, beta users can view the mixed reality project The Bridge in real life while standing at the corresponding locations. Once the app is fully launched, access to view the art through the app will be free and open in RL. If you would like to view the project in RL in NYC with a free invitation only beta account please IM Misprint Thursday or visit www.membit.co to learn more. LEA25 - now through Dec. 31.